This tutorial will hopefully provide a clear and basic path to the setup and operation of the DSD For Windows software. I am not the software author, nor am I the person that ported it to Windows. Both have my heartfelt thanks for providing us with a great tool to play with, but a lot of confusion remains for new users. This document will try its best to provide a generic approach to achieving best results. While DSD will decode many types of digital radio communications, this tutorial is based on the decoding of MotoTrbo/DMR signals. 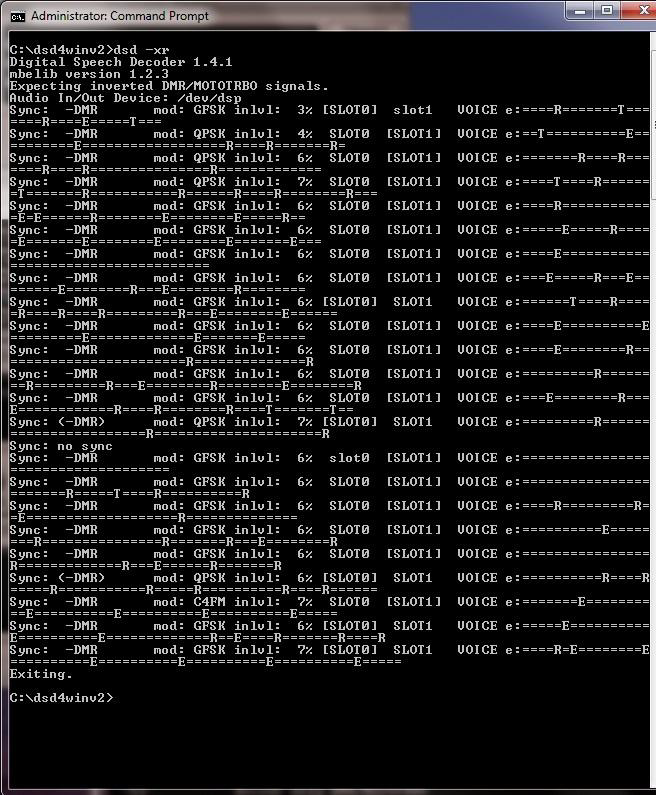 However, it should serve to get DSD running for just about anything that the software will decode. 1. A scanner or receiver with a discriminator tap. The speaker jack will not work. A record out jack will not work. It must be a discriminator tap. Check discriminator.nl for further information. Frankly, if you don’t know what a discriminator tap is…this software probably isn’t going to work for you! 2. Said discriminator tap should have a resistor inline. I’ve used 10k ohm resistors with good luck. If the tap does not have a resistor, one can simply be built into a cable by splicing it into the positive (tip) side. 10k ohm resistors are available cheap at Radio Shack. Part #271-1126 works fine. Again this will not be a discussion as to how to add a discriminator tap to a scanner. Check the website mentioned in item #1. 3. A computer that has a sound card with a LINE IN jack. Microphone jacks “may” work, but the LINE IN is by far the preferred way to go. 4. Windows 7 or Windows XP. This tutorial is built on Windows 7. XP configuration will be a little different but the same principles apply. 5. At least a working knowledge of how to manipulate Windows sound properties and how to get to the “DOS” prompt. 6. Patience! It’s almost certain that this program is not going to work “out of the box”. It will require some slight to considerable tweaking. Like snowflakes, I’ve found that no two versions of DSD are alike! 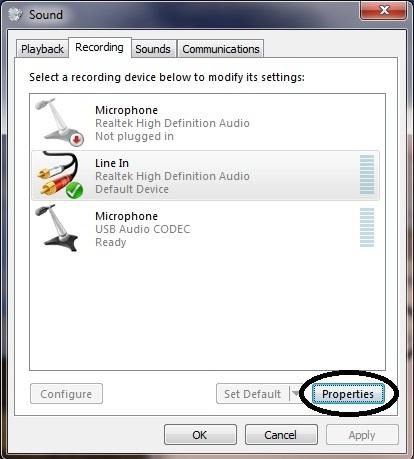 The second is to right click on the speaker icon in your system tray and then select Recording Devices. same methods. In either case the window shown below will appear. Discriminator taps contain unfiltered audio that can’t be squelched. In other words, turning up the squelch circuit on your scanner or receiver may silence the radio speaker but it will have no effect on the discriminator tap. 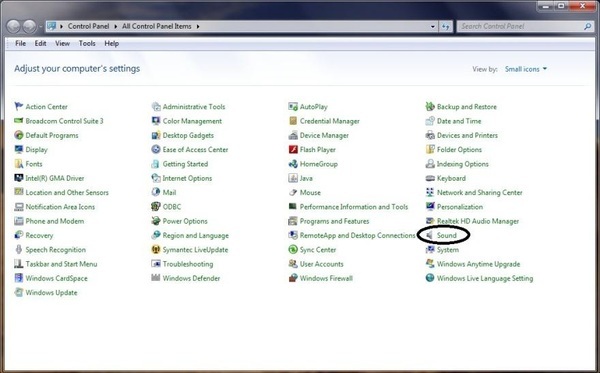 If you are hearing a rushing noise from your PC speakers, chances are that the box circled in the above photo is checked off. Simply click in the box to uncheck it. This will NOT affect the playback of the audio produced by the DSD software. 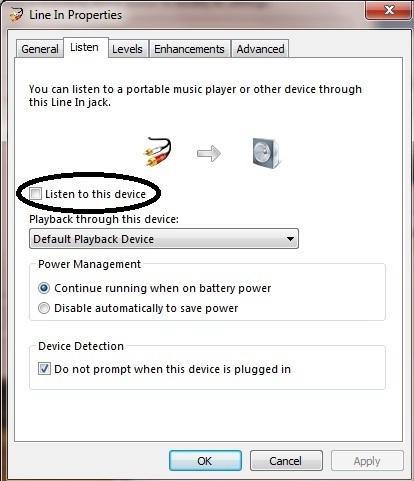 DSD’s audio output will always be played via the PC’s default PLAYBACK device. We have now completed the preliminary audio input setup for the use of DSD. At this point, if you haven’t already, you’ll need to power up your scanner or receiver. Again make sure that the discriminator tap of the scanner is connected to the LINE IN (preferably) of the device you selected as default. 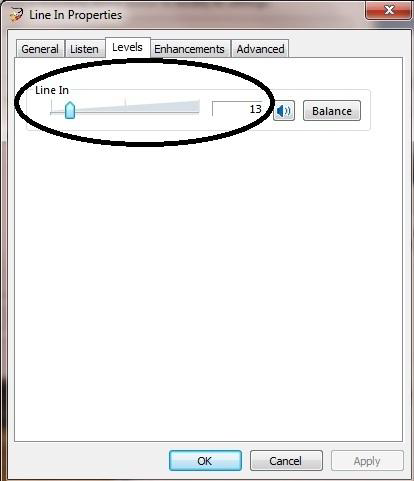 Tune the scanner or receiver to a frequency that you have confirmed has digital audio, and proceed to the next step of the tutorial. As a reminder, this tutorial is based on the reception of MotoTrbo/DMR type signals, but the general idea will be the same for whatever mode you’re attempting to listen to. To enjoy the full scope of DSD software this tutorial is going to explain how to run the software from the PC’s “Command Prompt”. Those of you that were around in the MS-DOS days of PC operating systems will be familiar with this prompt. Those that weren’t, fear not. 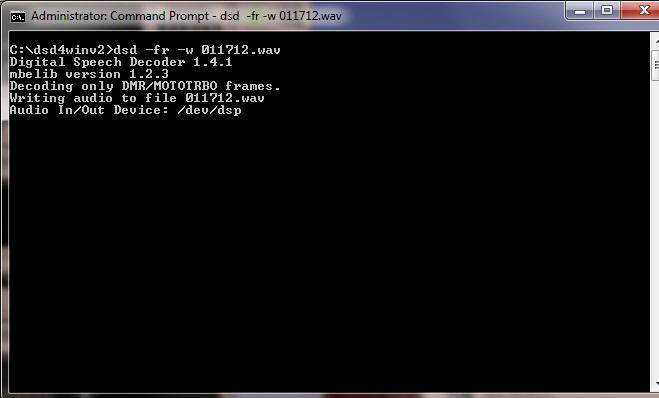 Manipulating DSD from the command prompt is relatively simple and straightforward. 1. 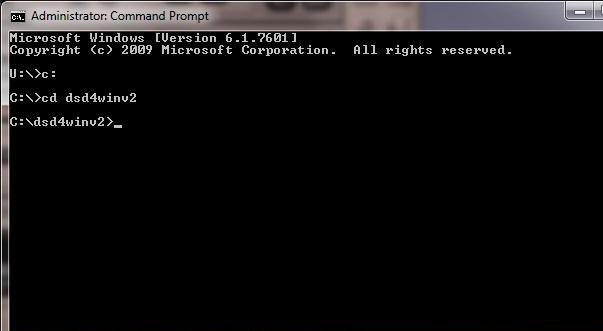 To get to the command prompt, click on the Start button that is normally located on the lower left of your screen. 2. Select the “All Programs” option. You can either hover over it or click on it to make it expand. 3. Scroll your way to the Accessories selection and do the same. 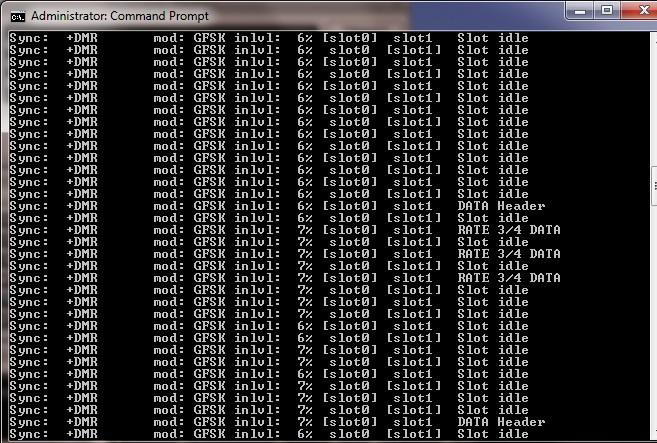 You will then see Command Prompt as one of the selections, as shown to the left. This tutorial assumes that you have DSD installed in a folder on your systems C: drive. You have to PATH your way to the folder that contains the DSD software. In the case above my DSD installation is in a folder called dsd4winv2. Note how I have pathed my way to that location. Normally you should already find yourself at the C:\> prompt. In this case I had to switch to my C drive by typing c: <enter> at the prompt. I then had to CD (change directory) to the folder dsd4winv2 by typing cd dsd4winv2. I am now at the command prompt in the folder from which I need to run DSD. As stated at the outset this tutorial assumes that you have a working knowledge of how to work from the command prompt. Other than this short segment it will not cover anything further along those lines. 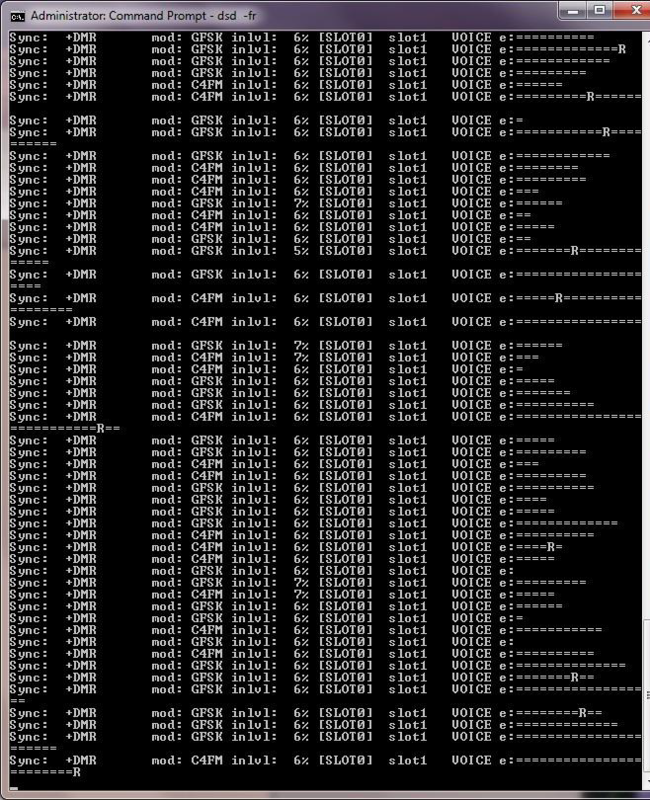 To see a list of all available commands that DSD offers, type dsd –h as shown above. You will see the information in the above screen appear. Note that there are numerous decoder options. These switches added to the command line allow you to change polarities if necessary and limit DSD to decoding only certain formats of digital audio. Under the Input/Output options you’ll notice that the –w switch allows you to record to a .wav file. We’ll cover this more towards the end of the tutorial. The above screen, and the accompanying “garbled voice” sounds will be one of the biggest “problems” a new user of DSD will encounter. If you are seeing something similar to the above and hearing what sounds like constant garbled voice while trying to decode MotoTrbo/DMR, you have DSD running in the wrong polarity. Simply end the program by holding down the CTRL key and pressing the letter C. This will return you to the command prompt as shown at the bottom. The only modes where receive polarity can be changed are MotoTrbo/DMR or X2-TDMA. DSD WILL work one way or the other. If you’re seeing the above, use the command line switches –xr or –fr to change polarity. Note above how there is a MINUS (-) sign to the left of DMR. 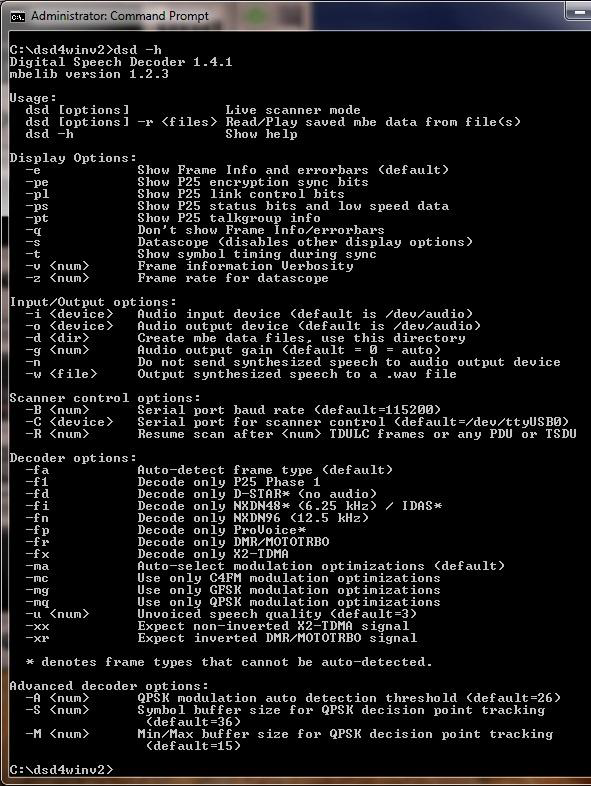 You will want to type dsd –fr at the command line to restart DSD and have it look for only positive polarity MotoTrbo/DMR signals. That magical decoded voice is going to be heard sooner or later. With MotoTrbo/DMR you may notice a lot of data scrolling but no voice heard. This appears to be common with this type of system. I have no other experience with this protocol; I’m sure someone with knowledge of it could explain exactly what’s going on here. When you hear voice though, you’ll see it on the screen as well, as shown below. Let the audio tweaking continue! Notice the VOICE indicator to the right of the above screenshot. The less equal signs that show to the right of the e:, the better the decode quality will be. I am doing pretty well with this transmission but I probably could be doing a little bit better. Suffice to say that as I see a display like this I am hearing reasonably good quality digital voice through my PC speakers. Use that previously shown slider to further tweak your audio input level until you have as few ====’s as possible. Note with the above I’m running DSD to decode just positive polarity MotoTrbo/DMR signals and I’m saving all of the audio to a file named 011712.wav. This file will be saved directly into the DSD folder where I can double click on it from My Computer or Windows Explorer and have it open in my default audio playback program. From time to time you may notice a brief “blurb” of unintelligible audio emanating from your PC’s speakers. This seems to be a normal trait of DSD, and it will almost always appear in conjunction with a “non-standard” display on the screen. For example, despite the fact that I’m telling DSD to decode only positive polarity MotoTrbo/DMR it may suddenly show a P25 signal, or an X2-TDMA signal. These are “phantom artifacts” for lack of a better description. You’ll notice them as well if you play back your audio file. 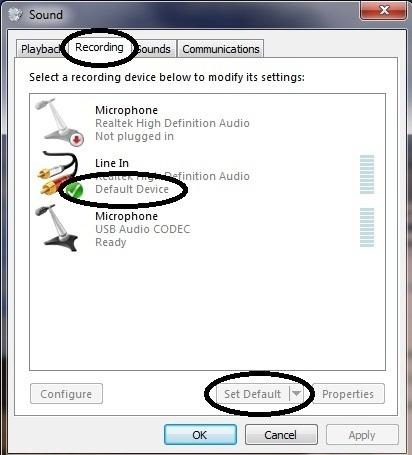 No worries, the real audio will be recorded fine and you’ll certainly hear it clearly if you’ve reached this point of the tutorial successfully. Some receivers are equipped out of the box with discriminator taps. I have used an Icom IC-R1500 receiver with great success with DSD. But, every scanner I have built a tap into has had the aforementioned 10k ohm resistor built in. Straight taps have not worked for me very well, but if you’re not sure spend the $2.00 or so at Radio Shack and build an external cable with one built into the “hot” side. From what I’ve seen this works just as well as having the resistor on board, and unless I’m sadly mistaken it can’t hurt anything being inline. I hope this has served in some small way to help some of you get started on this project. I will continue to partake in the threads at Radio Reference and at my website pertinent to DSD, but I’m not available for “support”. This tutorial in most cases should get you started. Best of luck, and enjoy! Oh, one more thing. This document can be freely distributed to all corners of the planet and beyond, just be kind and list Scott from Scan New England as its source, and of course give plenty of love to the creator of the software, and the fine gentleman that ported it to Windows. Thanks! This is a great guide I was happy getting the windows version to work but now using the simple dos instructions above I can simply set it to record so I can hear everything I missed while I was out. I can get fairly decent decoding but cant seem to get the equals down to just 3 or 4 or even none like some seem to be able to?